Maybe some of you remember our beloved border collie, Scooter. It took almost a year and a half after losing him before we felt ready for another dog. 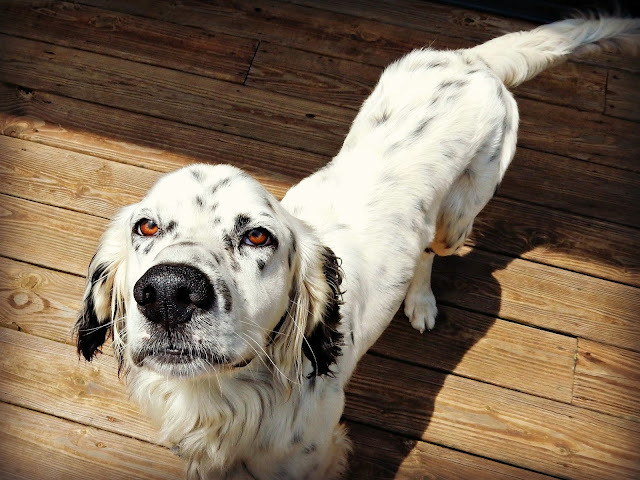 In a roundabout way, I heard about an English Setter that had been through a terrible tragedy and was looking for a new home. I went to see him and felt like he would be a good match for our farm. The boys had been asking for a dog for some time. Bo is very fast. He loves to run through our pastures. He has no trouble keeping up with the boys. Or with me, when I run. He is two and a half years old. We got him neutered and microchipped first thing. He needs to put on some weight. I had the vet do a big deworming. And am also hoping the neutering and constant availability of food will help. Look at that sweet face. We are happy to be able to offer him a fresh start. Hopefully he will enjoy living on Two Bears Farm. Oh what a handsome boy and sweet face! 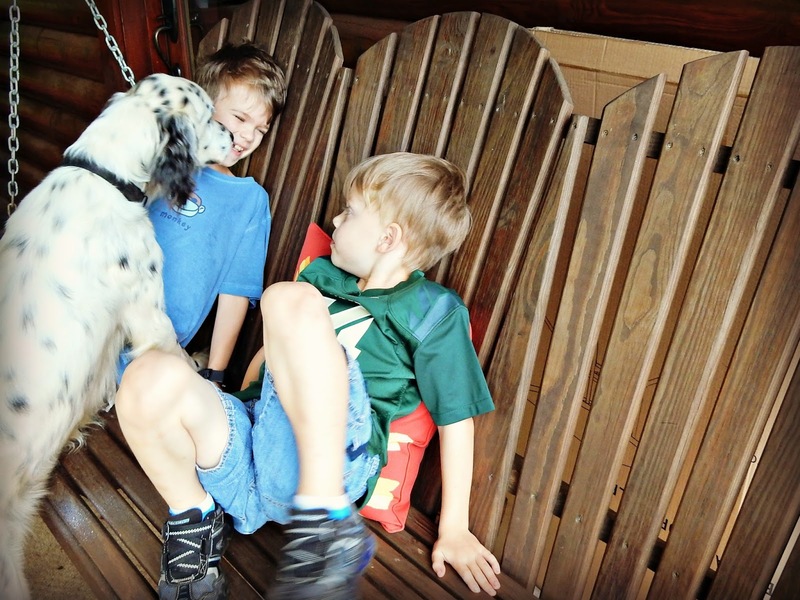 Picture the black spots and brown eyes gold and it could be my much-loved and missed English Setter, Gilly. I'm so glad Bo was taken in by your family, I know he'll have a great life with lots of love! wat zal hij een mooi leven tegemoet gaan. Cute pup, I have always had too many pets it seems. I thought they would diminish with kids leaving, but they don't. Looks like y'all have found a great new buddy! I bet he will love going for your morning runs. How could you not love a dog with that sweet face and those eyes! 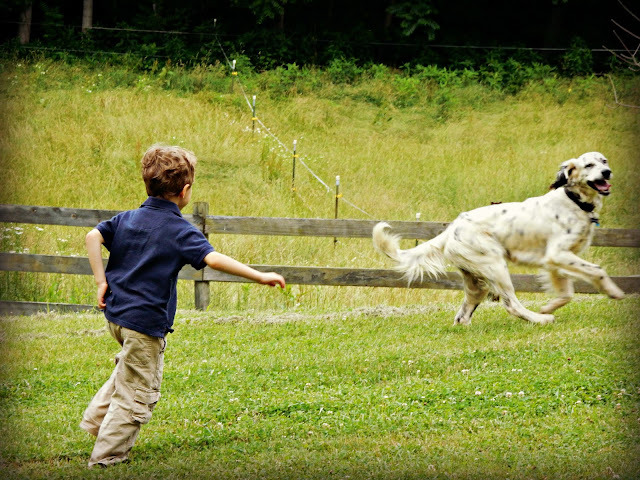 I just know he will be happy and enjoy running and playing at the farm. he is beautiful! and a joyous one! hooray for bo!! How wonderful! Every dog deserves his/her own family to love. It's such a good thing for everyone! Enjoy. I think that new family member will get lots of attention. :) That's just what he needs! He is SO beautiful! 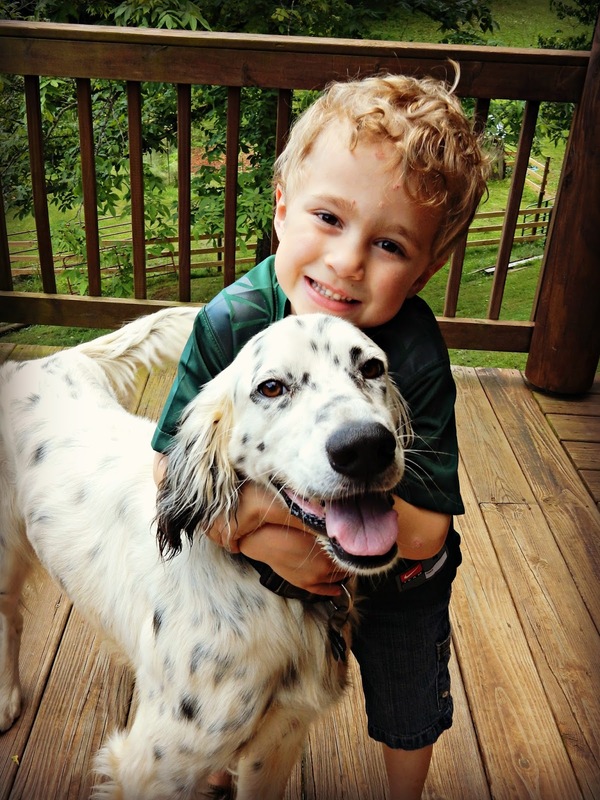 It looks like he's a great addition to your family. My dog passed away in February, and I thought I would be ready for another dog by now, but I'm just not there yet. Maybe early next year! He has the most expressive eyes. You kiddos look pretty happy, too...win-win~! What a lucky dog this is to be in a good home with your boys! know this will be a great match! He would be crazy not to be happy there - it is a win win situation! Bo is so beautiful! He looks happy,, and so do the boys! Oh yes,, we think Bo is going to love his new life,, and in his own way,, he is saying thank you for helping him to feel love,, and a new beginning. COngratulations!!!! Awesome... love stories like these.. Lisa you are teaching your boys such wonderful things with the rescue of the animals that they get to witness and be a part of. Bo is one lucky dog. What a beautiful dog, and what a magical event this summer for the boys! This is great news!! Congrats on the addition to your family! He's a very handsome dog. That's a fine dog. I am sure he will be an asset to the family. You've given a home to many a needy animal in your time. Awwww. He is a sweetheart Lisa, and I bet he is happy he found such a loving home. Oh, he is beautiful! He looks very happy. oh he is cute and i think he will have a very happy life!